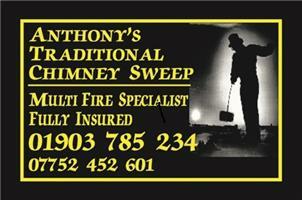 Anthony's Traditional Chimney Sweep - Chimney Sweep based in East Preston, West Sussex. We are proud to say that we believe we currently have the most feedbacks of all Chimney sweeps on Checkatrade. The whole process takes me about 1 hour from start to finish. I respect your home as if it was my own, I cover my shoes before I enter and will do my utmost to leave your home spotless. Advise on any issues and the best way to use your appliance. Sweeping Certificates issued. Prices vary with fire type and distance. Book in now for a time and day that is convenient for you but please remember that booking times offered are approximate as I may get delayed by obstructions (birds’ nests etc.) but I will do my utmost to get to you as soon and as close as I can to the time offered to you.